Bobbi Buller: WE GOT IN!!! 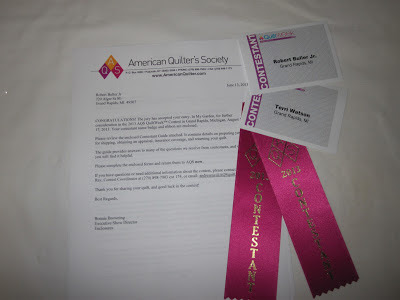 Terri and I received out acceptance letter for the AQS quilt show! I am so excited. I cried, of course, when I read the letter! So plan your trip to Grand Rapids August 14-17th and you can see In my Garden quilt in person. Hope to see you there! Jumping up and down for you!!! Woohoo-I knew you would get in as it is just beautiful. So excited for you! (us!) Can't wait to see it hanging in the show.